The Texas House tentatively approved a bill Tuesday that would require doctors to treat babies born alive after failed abortion attempts. Under House Bill 16, authored by state Rep. Jeff Leach, a Plano Republican, doctors who “fail to provide the appropriate medical treatment” would be charged with a third-degree felony and have to pay a fine of at least $100,000. The measure gives teeth to already existing statutes — including Texas Family Code and federal law — that grant legal protections to children born after abortion attempts. The “born alive” bill is part of a national Republican response to abortion advocates' efforts to roll back regulations on late-term abortions in states like New York and Virginia. Nine states have proposed versions of the bill this year, and the measure has advanced in North Carolina and Minnesota, according to Elizabeth Nash, state policy analyst for the abortion rights think tank the Guttmacher Institute. 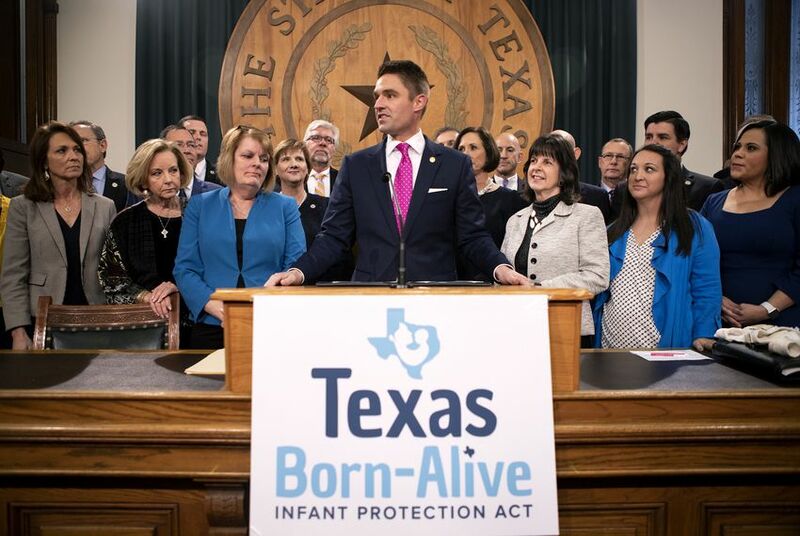 "At the heart of the bill, the 'Texas Born-Alive Protection Act' — it is designed to strengthen the protections to those babies who survive abortions," Leach said, surrounded by a huddle of the bill's dozens of co-authors. "Join me in supporting House Bill 16, showing the rest of the country — states like Virginia, New York and Washington, D.C. — that we’re going to continue to stand for life in this state." The measure tentatively passed Tuesday, 93-1. Rep. Harold V. Dutton Jr., a Houston Democrat, voted against the bill. Fifty members were present but didn't vote at the behest of state Rep. Donna Howard, who gave a tearful speech that incited applause from the floor. "The aim of HB 16 is clear: further stigmatize abortion, misinform the public, intimidate physicians and interfere with a woman’s ability to seek medical care," Howard said. "To debate this bill ... would legitimize its false information. We refuse to waste limited time we have here by entertaining malicious and purely political attacks against women and doctors." The Senate version authored by Sen. Lois Kolkhorst, a Brenham Republican, passed on a vote of 21-10 last week, with Democratic state Sens. Eddie Lucio of Brownsville and Judith Zaffirini of Laredo bucking their party to support the measure. The House and Senate versions differ in how they define the appropriate standard of care. HB 16 would require a physician to ensure that the infant be immediately transferred and admitted to a hospital, but Senate Bill 23 makes no such stipulation. The House bill, unlike its Senate counterpart, would also give an infant’s parent grounds to sue the abortion provider. “Where other states are passing legislations protecting abortionists ... and where Washington, D.C., can’t even bring the bill up for a vote, Texas will act,” Leach said during the bill’s hearing.